Following the MTI format, the „Fiberglass Advanced Techniques“ training combined the theory and practical elements related to working with resin based material. The purpose was to convey to the attendees the concept and the need of merging cosmetic integration, excellent sound quality and, most of all, to expedite the actual build time required to meet the market’s demanding requests. And, especially, to increase profits! The training was arranged by Mr. Wu Jie, owner of the company „Special City“, our Partner for China. Through a highly specialized team, Special City manages many training programs for their affiliates. 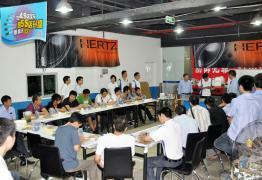 Check out the Photo Gallery Elettromedia for pictures of „Fiberglass Advanced Techniques“ training.